A favourite from my Christmas postcard collection. I see that it’s liked by others as this image has been used for various novelties. 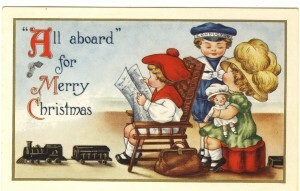 “All Aboard for Merry Christmas”, a coloured, embossed holiday postcard. No artist identified. Unmailed; message on back reads “Merry Christmas from Aunt Alice”. 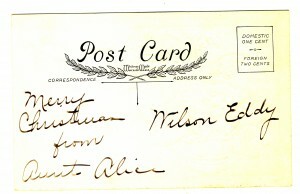 In the address section is the name “Wilson Eddy”. Circa 1910s; ‘Whitney Made, Worcester, Mass.’ is within the Post Card motif on the card’s back. For more about the publisher, see the entry for the Whitney Valentine Co. (1858-1942) in the Publishers’ listings of the Metropolitan Postcard Club of New York City. One website, CardCow.com, offers a free e-card with this image.